FDA and Pharma's death toll - Reform or Business as usual? The FDA has been in the line of fire for serious violations of its mission. The charge: Standing up for pharmaceutical profits rather than the health of those people who are using medicines. Under the FDA's rule, pharmaceutical companies have become the most profitable industry on planet earth, but our health is not getting any better - rather the reverse. Every year, national budgets are straining to meet increasing costs of healthcare, much of which goes to expensive but evidently quite useless pharmaceuticals. The companies that produce patentable medicines have the FDA in their pockets. They control the agency that is supposed to oversee their operations. The tool: user fees, which pay much of the FDA's budget, but which come with strings attached. The money may be used to expedite the approval of new pharmaceutical drugs but not to monitor their safety once they are on the market. 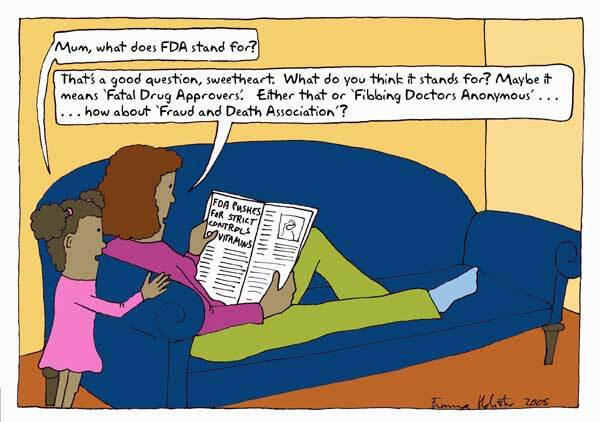 The FDA - Cartoon by Emma Holister. Advertising of pharmaceutical drugs to the public is a peculiar U.S. phenomenon, which allows great expansion of pharmaceutical business by driving demand, but it also leads to waste and to the widespread use of dangerous drugs. New illnesses are invented, promoted and drugs to treat them are provided - all for the profit of an industry that seems to have thrown decency and morals out the window and set its course on dominating every aspect of our lives. Disease mongering is the term and the practice has been challenged, but is continuing. According to some researchers, the health system in the U.S. has become the leading cause of injury and death. Does this mean anything to USA FDA Commissioner Von Eschenbach? Despite China’s draconian lack of civil liberties and its unequaled penchant putting its citizens to death, especially rowdy and “seditious” Tibetans, once in a great while, China justly takes an appropriate judicial action, especially when its government officials are embarrassed by two major recent scandals within one month, the pet food fiasco and the substitution of diethylene glycol for glycerine, leading to at least hundreds of deaths in Central America and India, from poisonous toothpaste. Zheng Xiaoyu, the ex-head of China's FDA, was sentenced to death for accepting $832,000 in drug company bribes. The USA is in the middle of a drug and food safety crisis, which extends to nations which ludicrously depend on the ghastly violations in the “high standards” of the FDA. How is it that FDA Commissioner Andrew von Eschenbach, M.D. gets his “get out of jail” card, based on the inherent flaws in our so-called “system?” Henry Waxman (D-CA), Chairman of House Oversight and Government Reform Committee, forced von Eschenbach this past Wednesday to testify on failures to warn Americans of the cardiovascular risk of death from taking Avandia, a $3 billion-a-year diabetes drug made by GlaxoSmithKline. Statistics obtained from the company’s own research predicted that 35,000 people would die taking Avandia last year; FDA chose to ignore these risks! Von Eschenbach's testimony will cover up FDA's lies. He will lament a lack of FDA funding, but, truly, the FDA neither is incompetent nor under funded. The truth is that the FDA does precisely what they want to do, to cater to corporate interests and please their corporate masters. "The point is that we need to look at the role of the FDA in being a bridge to the future, not a barrier to the future," he said recently in his office in Rockville. Responding to a suggestion that promoting collaborations with drug manufacturers, including an attempt to modernize human testing and finding genetic markers to predict suffering from side effects, may not be politic, von Eschenbach said the FDA is not working solely with pharmaceutical companies. "It's with everyone," he said, including government agencies and independent scientists. He defended the Avandia case, saying, "I believe we did it right with regard to Avandia." Waxman called FDA’s failure with Avandia's safety after it went on the market "a major failure of our system. The FDA never required the manufacturer to [conduct] a thorough post-market study of Avandia's heart risks." The hearing was scheduled as a result of a recent report in The New England Journal of Medicine that linked Avandia to increased risk of heart attacks. The timing couldn't be worse for the FDA as Waxman prepares the House version (HR.1561) of the Senate drug safety bill, and the Senate version is Big Pharma’s fake safety bill. Will the House put real teeth in the legislation? Avandia problems are the tips of the FDA iceberg. The truth becomes progressively more frightening. Collusion with the very industries the FDA is supposed to regulate has reached staggering proportions, and this is no accident during the Bush Administration, resulting in deaths and injuries to millions of Americans, all for drugs’ companies’ profits. Another example: antipsychotic Zyprexa, which FDA approved for use in adult schizophrenics knowing that the drug caused obesity and diabetes. FDA allows billions of taxpayer dollars to spent on medication to be given to children to treat mild behavioral issues, an unapproved use that leads to poor health and disease. FDA hides risks of drugs so that drug companies can turn them into best sellers, selling them in ways that were never approved in the first place. Safety problems are reported; FDA fails to act, partially so it won't look bad for approving the drugs; partially to continue the billions in profit for companies, and partially because FDA employees are jockeying for high-paying jobs in the industry that is being regulated! However, don’t conclude that the FDA is incompetent! In fact, FDA scientists routinely warn the directors of problems, who then intentionally decline to protect consumers. The economic position of drug companies is always placed ahead of human health. This is a dereliction of duty of the highest and most despicable order, and these abuses are just as bad or worse in the context of our adulterated food supply: GMO foods, additives, chemicals allowed in food, and chemicals allowed as flavoring agents and sweeteners. The FDA has no intentions to warn of toxicity of genetically modified food; it already even prevents labels that would give consumers any alarming details, and it suppresses information about natural ways to improve health. This ghastly business is all entirely intentional. China just gave the death sentence to its former FDA chief. In America we maybe conduct hearings, yet ultimately do nothing. Big Pharma and Big Biotech manipulate the FDA, the White House, and most of Congress, and their profits are above all and sacrosanct. Andrew von Eschenbach has never hidden his agenda; Americans just aren't paying attention! The top priority of the FDA and von Eschenbach’s dream is to bring new biotech drugs to the market with minimal safety testing and then conduct experiments on individuals as the drugs are used in clinical practice. Something like Dr. Mengele’s experiments in the concentration camps, this is called the “Critical Path Initiative.” Von Eschenbach states that this is the top priority of the FDA for many years to come (not food or drug safety). Despite his phony lofty goal of ending cancer by 2015, FDA critics recognize that von Eschenbach is an oncologist who wants to create a cancer industry in which nobody is ever cured; they are just subjected indefinitely to more expensive medications. Von Eschenbach led this effort for many years in Bush I’s “C-Change,” a group smoothing the development of Big Biotech drugs for profitable cancer "treatment." Senate Bill S.1082 and House bill HR.1561 could result in sweeping FDA "reform.” Will this legislation accomplish anything beneficial? Lobbyists from Big Pharma were able to influence the Senate to neutralize any real reform. Buried within this legislation is an attack on dietary supplements. Dietary supplements have always been challenged by FDA because they are safer and more effective than drugs. FDA acts as a police-force bully to crush competition and keep Americans ignorant about proven homeopathic venues to treat and to prevent illnesses. Bill S.1082 permits FDA to apply drug-related risk benefit analysis to the safety of food and dietary supplements and remove commonly used products from the market at their whim. At least one hundred thousand people tragically die per year at the hands of Big Pharma. Several million are injured so seriously they have to go to the hospital. FDA intentionally withholds from doctors and patients the true risks for drugs despite warnings of its own safety scientists and from independent experts. There is no question that FDA top management deserves the charge of “dereliction of duty.” What if Dr. von Eschenbach were held to the same standards of punishment recently demonstrated in China’s condemnation to death of its former FDA director? What will it take to wake the American public and consumers from their state of catatonic indifference? of Beverly Hills, Byron Richards, Mike Adams, Kenneth Stoller, M.D., and H.J. Roberts, M.D. in this analysis. "The FDA has essentially become the government affairs office of the pharmaceutical industry," Hinchey said in a statement, which called the relationship between the agency and industry "far too cozy and inappropriate." The Bush administration figured out that the fastest way to get the FDA out of the way of Big Pharma's profits was to appoint FDA critics to key positions, thereby changing the FDA from within. This began in August of 2001 when Bush appointed Daniel Troy as chief counsel of the FDA, a man best known for defending tobacco companies. Not a single Senator raised one concern about the significant safety issues inherent in the Critical Path Initiative/Reagan-Udall Foundation or conflicts of interest when Big Pharma and the FDA work side by side to develop, patent, and license drugs. The entire history of von Eschenbach's relationship with Big Pharma, Big Biotech, and C-Change has been conveniently ignored. What startles me is that last fall I reported on a study of the FDA's adverse events database in which researchers reported that Zyprexa had killed 1,005 people from 1998 to 2005, so this new accounting represents a large increase in deaths associated with the drug. Even more, according to that same study, Vioxx had killed 932 people. So why do Vioxx cases get all the media attention while Zyprexa does not? Why is Zyprexa still on the market and raking in $4 billion or so a year in sales while Vioxx is off the market? S1082: Will FDA Do Away With Pharma's Competition?